Ipomoea Sofa blossoms in the company of others and provides an inspiring space for people to come together. Using a thermochromatic ink, the Ipomoea flowers remain invisible until the heat from the bodies of those sitting on the sofa ‘activates’ the ink and the flowers are revealed. The plant depicted on the fabric is Ipomoea Costata and native to Central Australia, it flowers after desert rains. 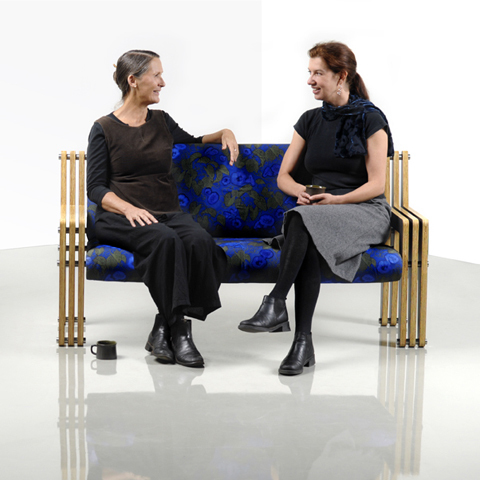 This work was previously known as Yala Sofa and referenced Indigenous culture. As it was not developed with or for the benefit of Indigenous people it has been renamed without any reference to the original experience or people that inspired it. The intention and experience of the work remain as intended; a celebration of people coming together.